Heya! As you probably know, it was my boyfriend's birthday earlier this month (I'm also offering some candy for this occassion so if you haven't checked it out yet, you can do it here ;)) and because it is VERY hard to buy something for him, I just made him a card and a money box (and I also put some € inside so he can buy himself something nice :D). So, here's the card I made for him. I did a lot of stamping on this card. And when I say a lot, I really mean A LOT. I just used some black cardstock and solid brown paper (which is actually a recycled envelope) for this card. Overy the envelope I stamped with Viva decor Floral embellishments stamps, Viva decor Cameo stamps and Recollections Paris stamps. For my main image I used one of my favourite quotes - it's a stamp from Cloud 9 design. I also used some ribbon and lace from my stash. For the corners I actually made my corner punch - I used my corner punch on a piece of white cardstock and then just cut these out to make them look like corners. The dots around the sentiment were made with Viva decor pearl pen. 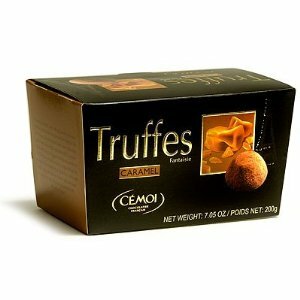 Do you know "Truffes"? Here they are selling them in the boxes as you can see in the picture bellow. Being a big chocoholic needless to say this box didn't last long. lol But I sort of liked the box so once it was empty I carefully took it apart and I used it as a template for the money box. I just put the box template on the cardstock and I outlined it and then cut it out with my scissors. And then I just added another hole so you can put money in. And this is the result. Since my boyfriend is more keen of the simple things, I didn't decorate the box much. I just inked the edges with TH Brushed corduroy distress ink and I stamped around the edges with Viva decor Floral embellishments stamps. Then all around I glued a ribbon. This ribbon is actually from one chocolate store (go figure! lol) that's called "Cukrček" (this is in slovenian and you could translade it something like "sweetie" or "honey") - I got it with the chocolate I bought there (they have amaaaaazing chocolate - quite pricey too, but worth it). I knew it would come handy one day. :) On the front of the money box I also made a small bow and placed a bead in the middle. Beautiful creativity with the box and I love all of the stamping you've done...looks amazing. wow, I just love the cards and all of the stamps in it! and the box is adorable: I bet your boyfriend loved it!!! Love all the stamping on the card - looks like you used very elegant patterned paper! Also love the idea of taking apart a box to use as a template - your money box turned out great! Thanks for joining us at Frosted Designs. Thanks so much for your lovely comments on my blog and becoming my follower. It gives me an opportunity to visit your blog too. I am following you to see more of your beautiful creations. Love the brown and black together and the wide lacey trim is so gorgeous! Thanks for playing along with us @ Frosted Designs!! Fantastic creations hun love the money box. Wow! I love this box! I think I need to make one for myself! It might actually help me save money ;) Love the chocolate coloured ribbon with the blue...it's one of my favourite colour combos! Thanks so much for playing along with us @ Frosted Designs! The box is perfect as it is - guys don't like the extras, do they?! I love the card too - beautifully done! Very lovely card and box. I had to take a closer look at your card and can see that a lot of work went into it - the result was worth it!